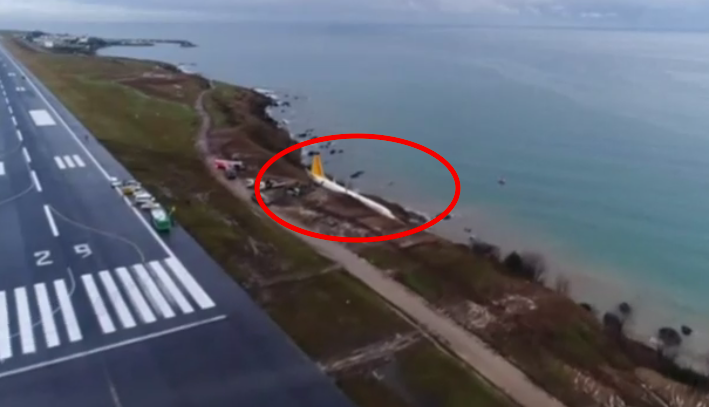 A Pegasus Airlines flight skid off the runway upon landing at Trabzon Airport in Turkey and plunged down the cliff, almost falling into the ocean with 168 passengers and crew on board. All individuals on board were able to be evacuated safely and without injuries even after this very serious runway excursion and subsequent drop down the edge. Whenever aircraft are involved in such an incident there are usually many injured passengers/crew or worse especially considering that in this situation the plane didn’t just skid off the runway but also dropped down a hill. BBC has an article and video (access here) short after the incident occurred Sunday afternoon. Everyone on board was evacuated safely, provincial governor Yucel Yavuz said. No injuries were reported. The cause of the accident is being investigated, officials said. Getting out of that wreck must have been super difficult and horrifying for those captured inside. The video itself shows how steep it was to reach the exits. Just wow. This could have gone terribly wrong with plenty of casualties not only from the runway excursion but especially in case had the plane dropped into the water. That everybody got off without a scratch is nothing short of a miracle. Back when the Lion Air flight overshot the runway in Bali 45 passengers got injured (see our old article here).